The dinam concept is a novel approach to simplified rapid development of wireless sensor network applications as well as an according WSN platform. As opposed to the traditional mote- based development archetype, dinam proposes combining the development steps into a single continuous, fluid process that is completely integrated into the node. 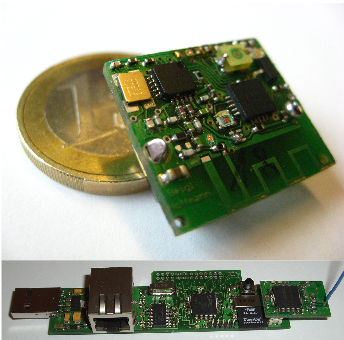 The dinam concept sensor node, called the dinam-mite, integrates all development tools, source code and other data into the sensor node system. This concept will greatly reduce the amount of effort required to develop wireless sensor network applications by removing the overhead of installation, iterative development steps and complexity of the development process. Initial results indicate that an integrated instruction and development period of 10 minutes is sufficient for simple applications using the dinam approach.